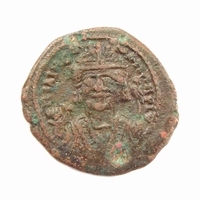 Bronze follis, Antioch mint (Theoupolis). 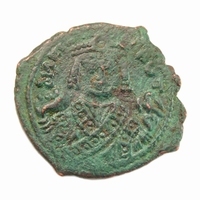 Obverse: Crowned and mantled bust facing, trefoil or \|/ pattern on crown, holding mappa and eagle-tipped sceptre. Legend: DM TIV CONSTAN PP AVI. Reverse: Large M, ANNO to left, regnal year IIIU to right, cross above, no letter below, THEUP in exergue.